Photo Caption: The Berkeley College community continues to assist the White Plains Youth Bureau with bringing holiday cheer to those in need. 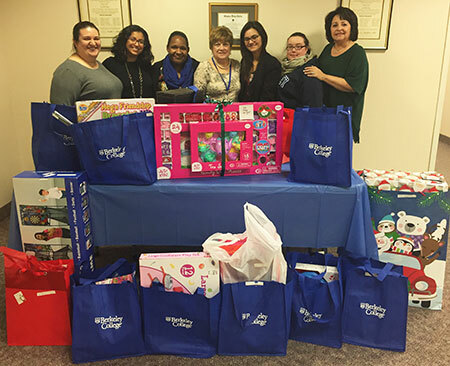 This season, Berkeley College associates purchased gifts for six families. The Bureau staff collected these gifts on December 14, 2017, to distribute to 11 children. Berkeley College associates also collected food to feed 13 families in White Plains, NY, for Thanksgiving. This is the seventh year the two organizations have partnered to serve those in need. “Berkeley College has provided overwhelming generosity year after year that helps local children and their families in White Plains have an enjoyable Thanksgiving and Christmas Holiday,” said Catherine Valenzuela, Youth Service Aide, White Plains Youth Bureau. Pictured above with the donated holiday gifts (L to R) are Berkeley College associates Jennifer Sanfratello, Student Accounts Administrator, Student Accounts; Natalie Aleman, Director, Center for Academic Success; Wendy Hewlett, Career Counselor, Career Services; Joanne Mazzullo, Administrative Assistant, Admissions; Liliana Ardaix, Admissions Associate, Admissions; Courtney Hernandez, Administrative Assistant, Academic Advisement; and Ana Yee, Director, Alumni Career Services and Quality Control, Career Services. 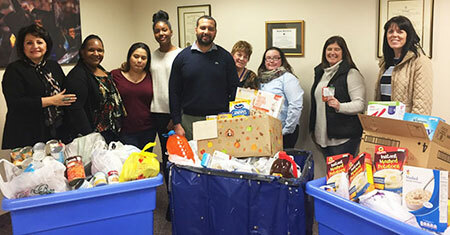 Pictured below, Ms. Valenzuela and Sheila Foley from the White Plains Youth Bureau (first and second from right) receive donated food from Berkeley College associates (L to R) Ms. Yee; Ms. Hewlett; Berkeley College students Margarita Loxley and Zara Marston; Daniel Lapan, Director, High School Admissions; Ms. Mazzullo; and Ms. Hernandez.